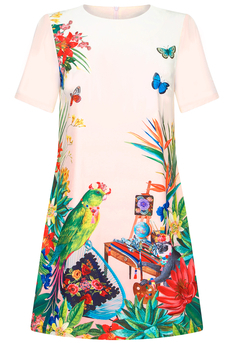 Mexican Garden Tunic-dress is made from crepe mid-weight fabric and printed with a vibrant color Mexican inspired scene design at the front and a simple light peach back. Has A-line cut with round neckline and short sleeves. It is fully lined and is approx. 87cm in length. New Summer 2019 Collection. Composition: 100% Polyester. Color: Light Peach.